This solar controller has been designed for easy operation and is intended to make your life easier and help you save energy and money. 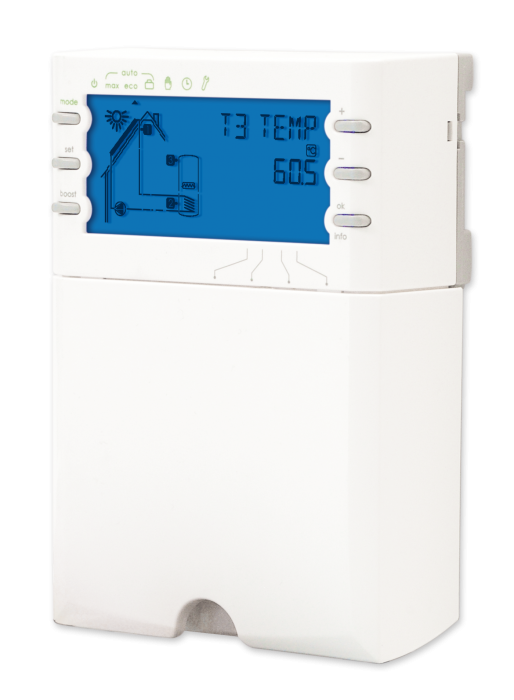 This solar controller is a product that can provide the answer to controlling 13 different domestic hot water solar system installations in an easy and efficient way, whether it is a new installation or an improvement to an existing one. Simple to operate, simple for the installer to set up, but cutting edge technology providing all the additional optional functions that systems require. + Energy savings: synchronization of off-peak periods. + System operating temperatures readout. + Heating Boost, instant or daily-programmed. + Collector or cylinder cooling functions and high temperature protection.